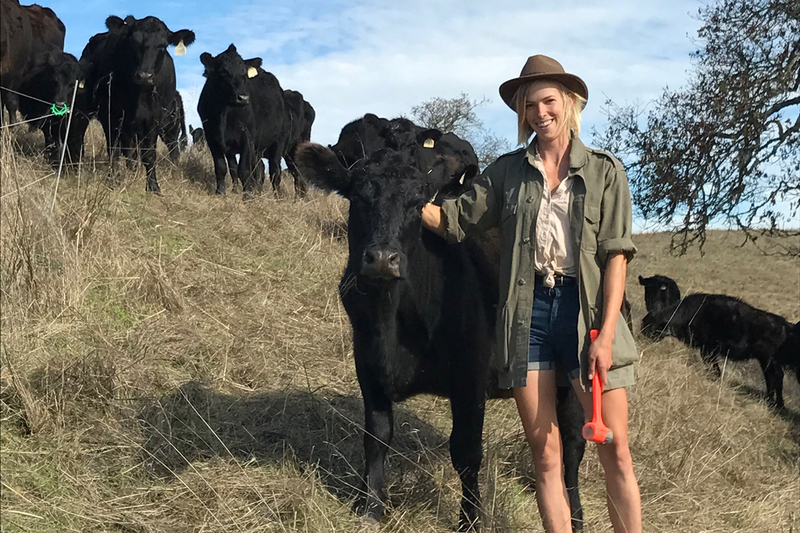 A grazier argues that this popular sentiment misses the point, and distracts us from the opportunity to adopt a diet that will restore ecosystems while nourishing people. I agree! After reading about Dr Savory's work restoring ecosystems and other rancher's success stories on revitalizing the Great Plains, I have really come to understand how important herd animals are to a thriving ecosystem! You say "Eat as much as you can afford", but also "quantity doesn't matter to me". But for the planet, quantity does matter. How much meat could be produced farming in this way, without clearing any more land for grazing? I dare say the answer is indeed less than is currently consumed. It would be great if all livestock were raised in this way, but I don't think it's possible unless we eat less meat. Or, if the wording of "eat less" is problematic because it implies zero meat as a goal, perhaps rewording that to "eat no more than your fair share of what the planet can sustain" would be better. Yes, but you don't know that 2/3 of the worlds land is grassland and can only stay healthy if livestock is grazed there. right now most of that grassland is degrading cause it needs animals. In the US, according to Dr. Allen Williams, US grass finished capacity can reach 40 million head culled annually from grasslands and marginal land allowed to revert to grassland. That exceeds current feedlot finishing of 29 mill head. What most people fail to understand is that with current US beef production, most 66 mill out of 82 mill head of inventory is ALREADY on grass in cow/calf and stocker operations. Production in the Amazon is only 4 to 6% pf global inventory. None of this production needs to happen. A lot of this production is done due to displacement and or as a way to hold onto land . SO no more deforestation is not necessary. BUT preserving and restoring grassland ecosystems are. Grasslands sequester as much carbon as tropical rain forest. Grasslands unfortunately are being destroyed FASTER than rain forests. See https://blog.ucsusa.org/andrea-basche/why-the-loss-of-grasslands-is-a-troubling-trend-for-agriculture-in-11-maps-and-graphs Insects and grassland bird populations are crashing. Well managed ruminants in these ecosystems presevre and restore biodiversity in these ecosystems. Plus rebuilding soils is also extremely important. Currently we're rapidly losing topsoil. Estimates are that we will lose all our topsoil in 60 years. The best way to rebuild soil quickly is with integrated livestock especially ruminants. So re-integrating livestock into cropping systems is yet another way to increase meat and crop production without ANY need to deforest any more land. The ruminants not only build soil, but they improve nutrient cycling, increase crop yields, increase nutrient density of crops, eliminate the need for NPK fertilizers as well as drastically reduce both organic and synthetic pesticide use especially herbicide use. As it stands, most land suitable for grazing doesn't need "cleared". Savannah and Steppe lands that are ideal for grazing cover a large majority of the Earth's landmass. Typically, clearing is involved for expansion of tillage crops such as legumes and grains (sold as the only way to feed the world). Many of these grains are used to feed livestock in controlled systems such as feedlots while grasslands degrade because humans have interrupted the natural grazing animal systems on these lands. 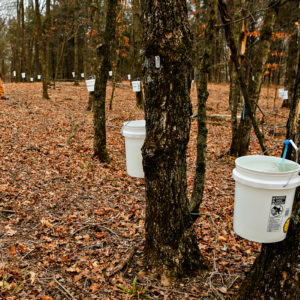 The current model clears forests to plant corn to feed to cattle in pens while grasslands have lost their natural nutrient cycles due to loss of grazing. This model is simultaneously destroying multiple ecosystems. When we look at the work of folks like Allan Savory and Dr. Richard Teague, and it is put into practice by people like the author of this article, a solution becomes apparent. But as it stands, managed grazing isn't as easy as cramming cattle in a feedlot and bringing in corn to feed. There is a necessary cost increase to the meat. Until the average person is aware of these systems, they will continue to buy their beef at Wal-Mart and funnel their money into destructive systems. The average consumer can be told "Eat Less Meat" or "Eat No Meat", but this is the same group that still smokes cigarettes, drinks alcohol, and throws trash out the window of their car. Making a shift to meat raised in regenerative systems is the only way to meet consumer demand without destroying our planet. The real land clearing issues come from plant based production. If everyone eats no meat, those calories must be replaced. With a population increasing rapidly, it requires clearing more forests for arable lands to grow these crops. Unfortunately, most appropriate grazing lands are not suitable for this type of agriculture so we are left with no option but to further clear lands. That is the real unsustainable system than cannot be scaled up without wholesale destruction of ecosystems. Yes! Eat less meat, but better meat. Lucky to have producers such as yourself here on the Central Coast of CA. And a USDA-certified processor, which is part of the battle as well. The ethical arguments against eating animals have been rehearsed a million times. The tacit assumption in this article is that we should not be concerned for the animals—tacit because their experience of "farming" and slaughter is not even raised as an issue. But to me the most compelling argument is simply that, like humans, or dogs or cats, animals like cows, pigs, even chickens are intelligent beings capable of a wide range of feeling, from compassion to fear. To kill them without need—and practically no humans /need/ meat to survive—seems a profound moral wrong. Actually there's a lot of concern for the life of animals, but that concern is for all the animals that occupy the ecosystem on the land that Ariel, and others like her, are regenerating. By regenerating land and restoring ecosystem functions, she's providing habitat for salamanders, deer, foxes, nesting birds, migratory birds, mice, vols, moles, badgers, bob cat, snakes, rabbits, etc. All of these types of field animals are displaced or destroyed by agricultural systems and other development. When you convert land, and then repeatedly till, cultivate, protect, irrigate, pollinate and harvest that land, you kill animals, insects and microbes plus destroy their habitats. So regeneratively grazing cattle is a trade off, a few animals are harvested so many many more can continue to live. Far more sentient beings are killed to produce rice, corn, soy, and beans than are killed in the process of raising meat - at least meat raised the right way. The need is to survive, and whatever you eat there is blood on your hands, unless you raise all your own food in a small garden where you live, that is the only true way to bring your blood print to almost zero. Quite the contrary, one of the byproducts of good grazing management is the restoration of ecosystems, and herds of cattle grazed properly have restored entire watersheds, which creates habitat for dozens if not hundreds of species of animals and insects that would not be there without the timed impact of the cattle. I do agree that it is painful to kill something that bleeds to survive, and we do it daily- no matter if you eat meat or anything for that matter. This is the cycle of life, and deserves our gratitude. Perhaps you could live your life as a Buddhist monk and never harm a worm, though that is not the reality for the majority of the planet. Going off of what Josh said in the comments, this article is a little weak in my opinion. It seems like the suggestion should be both eat less meat & eat better meat. We should still be saying eat less meat, since my impression is that there is not enough good, well sourced meat on the planet to sustain our current consumption habits. This quote, in particular, seems wrong to me: "So don’t “eat less meat.” Eat meat from people whose hands you can shake and whose ranches you can visit. Eat as much of that as you can afford, because that stuff comes from extensive production systems that impact hundreds and thousands of acres." I think this article would be more effective if it didn't take such a harsh stance. I do agree that we shouldn't say "Eat less meat" and end it there, and I also think that there are sustainable ways to eat some meat and unsustainable ways of being a vegetarian. This argument just fell short and seemed to lack complexity for me. The article is saying eat more sustainable meat that regenerates land. It's not advocating for eating more meat that isn't raise this way. So the not so implicit argument is to eat less meat raised the wrong way, Meat raised correctly is actually environmentally beneficial. Well raised grass finished meat, especially beef, is a nutrient dense source of essential amino acids, carnitine, fat soluble vitamins (A1, K2, D3), B12 and minerals especially heme iron and zinc. So in many ways, beef is a super food. I have heard a govt scientist on radio here saying that if we took all the cattle and sheep out of feedlots and released them into the grasslands we would reverse climate change in a couple of decades. I also attended a talk by a farmer who had abandoned fertilizer by feeding his cows "bio char" and introducing a variety of dung beetles. The charcoal in their belly allowed for the growth of a naturally occurring bacteria that convert methane into proteins, reducing the methane load to ZERO while pushing up gross meat volumes, and the dung beetles sequester the carbon in the soil while also providing deep aeration and fertilization. Results were astounding for both beast and land. Brilliant. I raise my battered hat to you. Yes! I love my farmer, and I love the environment! What a great article! Thank you! The last paragraph was a perfect ending for a beginning of a new way to look at things! We are graziers here at Rafter W Ranch in Simla, CO as well, so the article really hit home. Well written! So with you in your outlook. Over planting of fruits and veggies can also harm our environment. The destruction that palm oil industry has caused is also a worry. How do I find these people? I live in Northern Virginia. I don’t know the geography of Virginia so well but this farm is located somewhere in your state. They seem like they are doing really good work. The description of loving the land this precisely brought me to tears. Wonderfully thoughtful article that gives me a lot to think about and decide how to undo my thought process that I would stop eating meat-I see I just need to source and eat "ethical meats". Nice article Ariel and thank you for taking time to write. The best written, heartfelt, and truly penetrating article I have read on the stewardship of planet earth by grazing our cattle properly. We say “eat less cheap meat“. Grazing land is not an industrial feedlot. Cattle overfed on corn make for a poorer earth and an unhealthy population. Ariel Greenwood’s advice to,” Eat meat from people whose hands you can shake.”, is a truth not generally remembered at the supermarket. The problem with this is grazed pastures aren't ecosystems, North American ecosystems are diverse prairies, wetlands, forests, savanna's, deserts, and mountain tops. 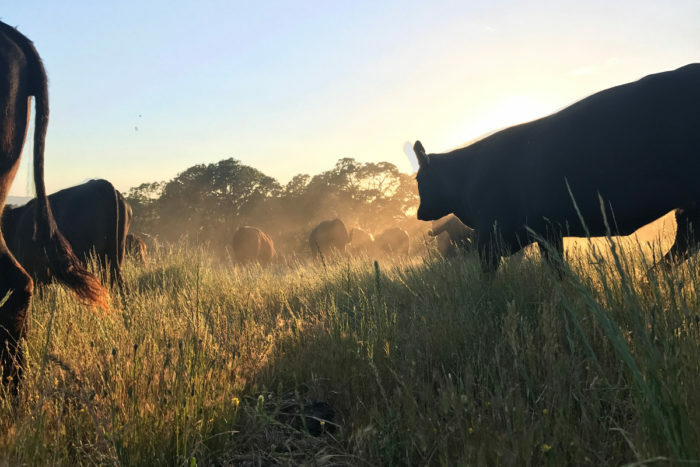 "Sourcing your protein from places you can account for means you can verify that their pastures are also habitat for foxes, badgers, burrowing owls, and bears—that you are keeping land wild and free." as quoted from the article. Since the majority of grazed land in America is overgrazed you can assume that it is far from "wild and free". Equating cow pastures with ecosystems that support a significant amount of biodiversity is like inferring honeybee hives thriving in peach orchards is a type of ecosystem health. With population increasing we will indeed, in this temperate climate, need to become less reliant on meat calories and more based in plant sourced calories if we are to retain biodiversity. For example Chris Hetzlier and the Nebraska Nature Conservancy have been doing studies using LIGHT stocks of cow to increase biodiversity in native prairies (a real ecosystem) using patch burn grazing. They have found that if the stocking rate is light enough, within the patch burn graze system, cows can increase native plant diversity. The only way sustainable grazing systems like this work with a rising population, is if we eat less meat. Sacrifices like this are necessary for true biodiversity + rising population. We are also 4th in the world in meat consumption per person, even though we live in a temperate climate where plant based agriculture isn't limited in all but the deserts of the south west and Alaska. Where as some countries are in climates that actually need to eat more meat due to the physical landscape supporting nearly only herbivores and keystone carnivores like Alaska. Thanks for that article PDF. I'll check it out. One thing I reckon with here on the ranches I graze is how to support the native grass plants' recovery cycles, which seem longer than the annual grasses and nonnative perennials like holcus lanatus, without going so long between grazing a given area that the species we do want become so overgrown with thatch that their growth is inhibited. I have no opinion on stocking rates in a given area; to my mind they should be determined by the plants, and built from there. In my experience over the years, higher impact and longer rest periods (as opposed to lower impact, but no actual rest period where cattle are outright excluded) seems to support the native bunch grasses and forbs best, but I'm not grazing the kind of ecosystem as described in the Prairie Nebraska piece. The discussion of what is pasture, what is grassland, and so on, is pretty tricky business. The semantics are slippery. On any given piece of land in my management, the cows are occupying a small slice of it. That's pretty common with those of us who plan our grazing around the recovery periods of plants, because good grazing as as much about where the cattle animals are -not-. The land surrounding the ranches I graze would almost certainly qualify as "cow pastures" and little more, with their low diversity, almost exclusively annual grass populations, incised stream banks, and compacted soil. Meanwhile, the ranches I graze are flowing with life. Again, not all grazing is created equal. I'd say even some of those who have celebrated this piece as vindication for their work might be missing the point. So, I think you have the order of operations wrong. "Eat less meat" doesn't necessarily make room for the wild lands and species you and I both love. Given what you've written, for the bioregion you describe, perhaps the better message would be "eat meat from systems that are shown to support native grass populations and trophic diversity," because imploring humans to "eat less" doesn't take into account the real pressures at work on land. We live in a vicious economy. Very large portions of North America were historically grasslands populated by wild ruminates in large herds and managed by apex predators. In what's now the continental United States, bison numbers are estimated to have been between 30 to 70 million, elk 20 to 30 million, pronghorn 20 to 35 million, deer around 30 million. So the amount of wild ruminates exceeded the number of currently domesticated ones. Most wild life was in these various grassland ecosystems, not forests or deserts or on mountain tops. Further back in time, there were even more species of bison that had an even wider range along with horses, camels, and large mammoth/mastodon. The mastodon and mammoth kept land from succeeding to forests. Man took over this role as keystone species using controlled burning to keep land open and under stories cleared.. So basically your entire premise is wrong. Most beef cattle graze on land that was once prairie, grasslands and Savannah populated by large herds of ruminants. Removing the wild ruminants is what led to massive land degradation along with poorly managed cattle that didn't biomimic these wild herds. Now grasslands are being destroyed at faster rates than rain forests for commodity crops used for ethanol, biofuel, seed oils, processed food ingredients and feed for CAFO's. Restoring and regenerating grassland is key to restoring these destroyed ecosystems. When you actually understand how regenerative grazing works, cattle occupy only a small portion of the land at any one time....about 1% of the land they graze. All the rest of the land is shared with other animals and insects especially birds. So regenerative ranches are actually more like nature preserves. Thank you! Nail smack bang on the head, keep beating the drum please, i want to help anyway i can. I' ve just moved to Germany i want to do what i can here. I'm a doctoral researcher in evolutionary biology, and I have a degree in biology from Oxford as well as a Masters, alongside a background in ecology and a lifetime spent in the natural world. Unfortunately, the claims made by the author of this article on the sustainability of extensively-grazed "livestock" are unsubstantiated, and go against the scientific consensus among ecologists and economists. Nidjam et al. (2012) found that extensively-grazed ruminants are responsible for vastly more methane emissions than any other form of agriculture, while Ripple et al (2014) report that ruminant agriculture is the single largest methane emitter compared to e.g. the fossil fuel sector. Non-CO2 emissions (of which methane is the main component) account for a third of all anthropogenic greenhouse gas emissions, and further, are considered much more 'potent' climate forcers than CO2. More recently, the 'Grazed & Confused' report concluded that grazed cattle are unequivocally bad for the environment, and Wolf et al (2017) found that "livestock" in any kind of farming system are net greenhouse gas emitters. As for other purported environmental benefits of "livestock" grazing, they really don't stack up to the available evidence. For example, Erb et al (2015) looked at which food production systems would result in a net-zero increase in agricultural land by the 2050, and thus prevent further destruction of already fragile wild habitat. They found that the only diets that achieve this are plant-based. Also see Alexandrowicz et al (2016) and Springmann et al (2016) for further exploration of why plant-based food production systems have the greatest possible benefit for GHG emissions, land-use, water-use, human health, and conservation. As a final note, I'd like to point out that, even if "cattle" grazing were beneficial for ecosystems and habitat management, this would not necessitate murdering those animals for food. We could instead value those individuals as co-inhabitors of the landscape and leave them in peace, while gaining the tangible and intangible benefits of the ecosystem services they provide. Indeed, rewilding of habitats with native species, such has been achieved in the Oostvaardersplassen, is a viable option with precedent, that doesn't require us to financially support conservation by enslaving and killing complex, sentient animals. Thank you. It really is distressing how followers of the church of regenerative grazing continually compare the the mass farming of domesticated animals brought over from Europe to anything like a natural ecosystem, and pretend to be "in it for the microbes" when they're so clearly in it for the meat. Jack- what I wish for you and for all those who say that regenerative grazing doesn't work, can't work, so-and-so says it will never work, etc, is that you would go and work on a regenerative grazing operation for a year. I'd especially wish that Monbiot would do this, since people seem to think his word carries such weight. With a solid year of seeing it work, understanding why it does work, how it has always worked since the beginning of time, and most of all perhaps- what's wrong with the alternative... then you can go back and figure out where such articles as "Grazed and Confused" went wrong. Because I promise, they are written by people in very ivory towers who start from the premise that it doesnt work. Let’s consider how much carbon is sequestered from better grazing management. A series of peer-reviewed studies found that the practices sequestered an average of 1.8 t CO2/ha/yr (0.5 t C/ha/yr) (see page 63, Figure 9). (1) The collected papers in the figure are shown alongside non-peer-reviewed claims from folks such as Allan Savory. At typical stocking rates for improved pastures, found on page 109, Table 8, there are 1-2 ruminant animals per hectare. When considering ruminant emissions (CO2 and CH4), the sequestration benefits are almost always canceled out at these higher stocking rates (see page 65, Figure 10). However, the chart doesn’t include N20 emissions as noted on page 65. Only at low stocking rates, which are not common on improved pastures, and with higher C storage potential in soils, does this work out in favor of ruminants in the long-term. A separate study puts greenhouse gas emissions from a cow at nearly 3 t CO2e/yr, including N2O emissions (in CO2 equivalents), Table 5-10 on page 5-45. (2) At those levels, it makes it even more difficult for improved grazing management to provide any net benefits. I appreciate the time and thought cycles you've invested in this. To be honest, your last paragraph leaves me disinclined to respond, because you've thrown up a philosophical wall. Having said that, there's a lot about ranching I don't like, and over the next few generations I hope that human appetite becomes increasingly attuned to ecological health and biodiversity such that the land currently in recovery thru grazing that is tailored to soil and plant restoration will see the trophic web become so robust that native herbivores yield the benefits currently best served thru domestic ruminants (in my experience). When I ask myself what the barriers are to this, I do see the world's appetite for cheap flesh as a terrible counterforce, and I see our appetite for flesh that comes from animals that were a net benefit to their ecosystems as positive force towards a truly rewilded planet. But of course, it's an interim process. (This is where Monbiot and I disagree--we want to live in the same world but have very different opinions on how to get there). Another huge barrier is land use and development. This is another reason why I graze: land that is demonstrably healthy has a better chance of keeping out other forms of agriculture (annual ag, grapevines, etc) and resists housing and commercial development. I think we should be eating mostly plants, too. But where we crucially differ is I believe we should be sourcing our protein and other macro and micronutrients from landscape restoring sources. Most plant based diets are derived from annual agricultural systems that are even less like "natural" ecosystems than a poorly managed cow pasture. I don't want to support those systems. But if I felt that I was doing a morally reprehensible thing by consuming the flesh of sentient creatures, no amount of ecological calculus could convince me otherwise, so I won't bother you on that matter. I felt like in my article I was saying "source your protein from animals that improved ecosystems," and detractors are saying "that can't be done," by citing sources that have nothing to do with the kind of grazing I do, and don't address the symptoms of land in decline that I see in my immediate bioregion. So my initial statement should not be a threat (except for vegans, but there's no getting around that)--it appears people really just *don't believe me* and the claims I make, because they haven't seen it, and it's poorly researched (though that's changing fast). So, that's encouraging to me to do a better job documenting and storytelling. I can't fault anyone for not seeing what I see if I haven't shown them. Enteric methane and methane in general is an interesting topic. Methane is generated from multiple biogenic and anthropogenic sources. Compacted anaerobic soils emit methane. Tilled and Syn N dependent Ag systems increase compaction. Well managed cattle don't. Well managed cattle increase the capacity of soils to function as methane sinks. Whereas Ag systems with tillage and or Syn N use turn these methane sinks into emitters. When the soil methane sink is reduced or becomes a source of emission, more CH4 from multiple sources gets emitted into the larger methane sink, the hydroxyl radical [OH] sink in the troposphere. This along with carbon monoxide emissions reduces the efficacy of these OH hydroxyl radicals to oxidize methane. When you have sufficient OH hydroxyl radicals, most methane doesn't make it into the stratosphere. Methane levels didn’t increase from 1998 to 2007, possibly in part to there being more hydroxyl radicals in the troposphere..
Atmospheric science is a bit more complex than what you read in the mass media. It isn't as simple as it is portrayed. Bottom-up analysis tends to blame the sources of methane where there's the most available data to extrapolate (e.g. cattle), but a lot of the top down isotopic data doesn't support this villianization. Isotopic data shows other sources for accumulated CH4 amounts particularly from shale and gas industries....though this too is debatable. There may be other unmeasured or not so well identified sources for this excess methane like the compacted anaerobic soils noted above. So, in summary, CH4 discussions tend to be super reductive. Soil and hydroxyl radicals provide large sinks in the geosphere and troposphere but these sinks are never accounted for in bottom-up analysis. CH4 in the stratosphere depends on OH oxidation. OH levels are impacted by O3, H2O vapor, CO, CH4 and NOx levels. CH4 has a much shorter cycle that CO & CO2, thus equivalency isn’t necessarily equivalent. Additionally when natural gas is combusted, carbon monoxide CO is formed. This CO reacts with OH to form CO2, and reduces the amount of OH for CH4 oxidation. So, again, a bit more complex than simply "cows" burping and farting. You obviously haven't a clue as to how people like Ariel actually manage their cattle and regenerate land. One of the many problems with resorting to meta-analysis rather than actual field research is that so much of the soil science is relatively new. FCRN and Norberg and others are making the same exact mistake you're making. They're looking through a lot of outdated data rather than actually getting their boots dirty. Just look at FCRN's report. During the entire 127 page report the terms "soil health", "soil ecosystem", soil microbes" and "topsoil loss" aren't mentioned at all even though soil carbon capture and respiration rates are completely dependent on the soil's health and microbiology as many of the more progressive soil scientists like Dr. David C Johnson, Dr. Christine Jones, Dr. Elaine Ingham as well as geologist Dr. David Montgomery and author Graeme Sait have pointed out in their research and or writings. Basically Johnson notes that with healthier soils that have more fungi than bacteria, there is significantly more carbon capture (10+ times) and less carbon respiration. Long rooted perennial systems also pull carbon down deeper into the soil where the carbon is less volatile. Additionally, Johnson notes that, while there is a limit to how much carbon soil can store/sequester, there is no limit to how much soil that can be built. So more soil equals more carbon sequestration. Given how rapidly soil is being lost (some projections note the planet will lose all of its top soil in 60 years), building new top soil is incredibly important. Relying solely on geology, building new topsoil takes over 100 years to build from the bottom up. But with composting, soil can be built more quickly from the top down. What do ruminants do? They are nature's mowers, composters and spreaders. Well managed ruminants, especially in more arid brittle environments with seasonal humidity are the best way to build more healthy topsoil the most rapidly as Gabe Brown points out in this video, Keys to Building Healthy Soil, https://youtu.be/9yPjoh9YJMk Soils with animals manures have the most and greatest microbial diversity and soil is made largely from dead microbes, not deteriorating organic matter. So the greater and more diverse the soil microbial mix the better for building soil. Now what else do healthy soils do? They increase water infiltration and retention. So healthy soil ecosystems improve drought resistance and therefore increases plant growth. With more plant growth, there is more evapotranspiration, and thus healthy soils actually increase rainfall. With no-till systems and continuous cover, more moisture in the soil improves the soil ecosystem for methantrophic activity. With more rain, and moisture, some of those methanotrophs become airborne. So methanotrophs in the soils, mitigate CH4 emissions from manure and airborne methanotrophs mitigate enteric methane in the atmosphere. A more effective soil sink also reduces the load of CH4 that gets oxidized in the troposphere. Moreover, other soil microbes make sure more of the nitrogen (urea) in the manure is broken down into forms of nitrogen that plants can use like NH4 rather than are emitted into the atmosphere like nitrous oxide N2O. This natural occurring nitrogen doesn't leech into the environment like synthetic nitrogen that plants only utilize a small fraction of for growth. Most synthetic N runs off compacted soils into waterways causing aquatic hypoxia (dead zones). Healthy soils are the key to everything, so it was quite shocking that this report completely overlooked this topic. Holistic management is not simply another grazing system for moving cattle. No, holistic management is a systems approach to regenerating land/soil health, ecosystem function and economic well being. The solutions to let grasslands all become forests was quite comical as well, since most of the planet's grasslands are in brittle environments with little rain fall or seasonal humidity, so unless you improve soil health, most trees will die. Moreover from an ecological history point of view, most grasslands weren't forests. Grasslands co-evolved with large megafauna , grazing ruminants, and apex predators. When mankind helped kill off the megafuana, he became the keystone species who used controlled burning to reduce plant succession. Converting grasslands to bioenergy crops is even more absurd....because this is what's actually happening and leading to the destruction of drought resistant biodiverse grasslands with monocrops of blue water dependent seed oil crops used for ethanol, biofuels, processed food ingredients, cooking oils, industrial products and CAFO feeds. FCRN's suggestions for alternative grassland uses, in other words, are just plain dumb. There are many other shortcomings with FCRN's report, though the lack of discussion of soil science and soil health's role in GHG balances, as discussed above, is the most glaring and egregious one. Now the notion that ranchers shouldn't cull their herds for meat is a romantic one. Though unfortunately such romantic notions don't pay bills, especially taxes, labor costs and or land leases. Ranchers and farmers need as many revenue streams as possible to make ends meet. Not everything un the real world can be funded by kickstarter and indiegogo campaigns. The meat that ranchers like Ariel sells funds the costs of regenerating the land and helps sustain rural economies. Guess what—plant based diets feed way more people and don’t involve killing other beings. In a world where children are starving to death, it’s criminal to use huge amounts of land so some people can eat animals. The kind of grazing I practice involves stocking rates tailored to the plant growth patterns and our ecological goals for our ranches (which generally are something like, increased biodiversity, improved soil carbon, improved water holding capacity, improved native plant recruitment, etc). Not only are these lands unsuitable for annual agriculture, I would argue that grasslands themselves have a right to remain as such, and so the implication that they'd be better used to grow grains and annual vegetables rather than serve as habitat to myriad wildlife while being maintained by livestock (until wildlife populations are robust enough.. haste the day) just doesn't fly with me. As noted elsewhere already in the comments above, plant based diets include a lot of death to all the animals whose ecosystems have been destroyed for crops, orchards and plantations. So you're either oblivious to the impacts of crop production or deluding yourself into believing that plant based diets don't include death. Apologists like these don't explain how to move the market toward this ideal of better meat before the planet has been wrecked by the demand for more meat, the way it's done now. "Ethical" meat products are already available, cost more than people want to pay, and in most cases, create more environmental damage than plant farming. The exceptions prove the rule and don't affect the discussion materially. You are essentially pointing out that the poor can't really afford to pay the true cost of meat to the producers and the planet. In the meantime, more responsible people can only repeat: PLEASE eat less meat. Animals are certainly crucial to our ecosystem. Farmed animals replace wild animals on the land. Dear Ariel, we have no problems with you. Our beef is with the, as you said rightly - "Industrially produced meat is unquestionably bad for the environment, and for animals." That is doing all the damage to the environment, that is treating the animals with extreme cruelty and the meat produced with using antibiotics and growth hormones is very injurious to our human health. We are becoming immune to antibiotics making it difficult to treat various illnesses. Our campaign is "Eat Less Meat". That does not mean don't eat meat at all. Another problem is the quantity of meat being consumed in Australia, 112Kgs per person per year, which is three times the quantity recommended for a healthy adult by the Health Authorities. So please don't blame "Eat Less Meat" campaign. Respectfully Vijai, but I can't get on board with this. "Eat less meat" still permits people to eat the very meat you and decry. People should not be eating any of that. It should be boycotted wholesale. You're missing an opportunity to tailor people's appetites towards something that is helpful for their environment, while implicitly giving irresponsible meat decisions a pass. In OZ, so many of the recommendations made by "Health Authorities" have been affected by the beliefs of Seventh Day Adventists. So not sure, I'd take any such recommendations that seriously. I too am one of these grazer farmers living in Kamberg, RSA..... thank you for bringing some intellectual logic into the beef industry. Many years ago, I visited a local health spa, and for the hell of it, I attended a lecture, given by the owner about menopause. Well, menopause my foot, beef industry, added hormones, cancer.... and finally “beef is bad for you” was the topic of the lecture. I was horrified. I could just imagine all these woman, padding around in the white “sheep” gowns, gullibly taking in all this information. Eventually, I couldn’t stand it anymore! I asked where she had gotten her statistics.... local, she said. I explained I was a local beef farmer and never once injected hormones into our cattle. Our cattle are grass fed and get a lick which adds the necassary trace elements. I added that her info wasn’t true of the community and that she was doing damage to a very honorable industry. And then walked out!!! Thank you for attending to this subject. Yes, it is an honourable career! Yes, we are constantly running thru the options in order to bring the best product to the table. As shepherds of our cattle, we take our task very seriously and offer the cattle the best environmental conditions possible. Thank you for a wonderfully written, unemotional, yet passionate explanation of your work and that of your colleagues, the truthful realities thereof as well as those of our existence. I shall endeavour to spread your message far and wide within my sphere of influence. May you, your families and colleagues, your land and animals be forever Blessed! Couldn’t agree more! & if you want an excellent read on this, check out Forrest Pritchard’s wonderful book Gaining Ground. This is excellent environmental management. I believe that we humans will only survive if we learn to live symbiotically, gives way to full flora and fauna diversity, consuming only what we need and contributing our 'intelligence' back into the management of our environmental footprint. Most of all we must desist completely from cruelty, unmanaged waste and unfettered extraction. As the article demonstrates, this is not a simple task and the price of failure is surprisingly early extinction. it is reassuring to know that there are responsible graziers. I do feel that, because they produce less "meat", and it is at a higher cost, that we need to reduce the demand for cheap meats and concentrate on quality. get the profit motive out of the picture. I appreciate this well-written piece. It augments my long-standing defense of our local, all-grass-fed meats here in Vermont, which I sometimes find myself having to do with fellow environmental activists. And thank you for what you're doing. YOU are the kind of farmer I support! It's an added expense I've been happy to shoulder for 20 years now, and it's satisfying to see the indirect result: an ever-increasing number of young, local farmers here doing it your way. Great.. Love to hear this... Your last Paragraph Nailed it. . Allow the land to revert back to natural scrub and meadow and grow edible plant crops where the land is suitable on a rotational system. Animals that have been hunted off the land by ranchers will return and fulfill their natural role of maintaining the land and ecosystem. Why fight so hard to keep doing something that is bad for our health and leads to the unnecessary slaughter of billions of animals? Allan Savory has been thoroughly debunked. Only those with financial interest or a serious addiction to eating animals are here screaming that this nonsense is good for the environment. Actually Savory hasn't been debunked whatsoever. Those claiming to do such debunking haven't even looked at holistically managed [HM] systems. They've looked at short duration rotational [SDR] grazing systems. HM and SDR's aren't the same thing. I doubt you know the difference. Those making similar claims in regards to soil carbon, haven't discussed the soil microbiology which drives carbon capture. Well managed livestock increases soil microbiology especially arbuscular mycorrhizal fungi. Increase soil microbiology especially AMF's, and you drastically increase carbon capture and retention. Expecting land to rewild itself, aside from being completely unrealistic from an economic point of view on private land, hasn't work. The land has just degraded further. Plus such rewilding relies on the re-establishment of other apex predators for the ecosystem to function properly. (Reintroduction of predators can be problematic with cars and near urban centers). Thus "killing" still has to occur for the ecosystem to be balanced. Otherwise wild ruminants over graze as well because there is no predatory pressure to move. I'm glad I read that all through on this fine morning. For the past few weeks I was having mixed feelings on Vegetarianism, and the past three years all I've been able to manage doing was Eat less meat. The mixed feelings came from me wondering what happens with all the extra animals that simply cannot be just set free. We can't turn our backs on them considering what Man and Woman used to have to do, when they just could never forage enough natural food sources, for a family, tribe, or clan. And it is a delicacy, many have completely forgotten that when it feels like Thanksgiving Holiday every week. Brilliant - I have been banging on about this for years, glad to know I am not the only one. An excellent article Ariel, and welcome contribution to the debate! Those farming sustainably should be rewarded for their contributions to the environment. 'Eat less meat', at least as promoted by WHO and their ilk, clearly isn't linked to stigmatising stock farmers, but derives from an extensive body of hard evidence relating to the 'over consumption' of meat. This is not my area, but I do recall doctors in a volunteer programme in Namibia after that country's Independence (1990), expressing grave concern at the high blood pressure and worse, of the Herero population who were near exclusive meat eaters. Appreciate that alone doesn't exactly prove the point - although the evidence is there aplenty - but wanted an introduction to my next point. Extensive cattle ranching in Namibia by whites (i.e. fenced farms rather than traditional pastoralist) had significantly altered the savannah, with bush encroachment being widespread. The cause of this degradation to the environment was proven to be linked to the exclusion of the diversity of herbivores, notably antelope, that had previously grazed and browsed the savannah flora. One can only be impressed by the level of knowledge and passion of Ariel, and those like her, but they too may be guilty of downplaying the 'shifting baseline' that might reveal an even richer landscape where livestock are limited or excluded. A balance may well be possible but many of the uplands in the UK have been denuded of their once extensive tree cover through the introduction of sheep! Greater sharing of experiences by all stakeholders is required to minimise 'hurt feelings' and identify solutions that will benefit all! What's you're describing is HUMAN mismanagement particularly in the Uplands. That type of continuous grazing is completely different from what Ariel, and others like her, are doing. You really should go onto the land to understand the impacts of different management systems. Regenerative grazing isn't the same thing as continuous grazing. Great article! I agree that meat well raised by my local farmers and home raised is good, along with wild caught and no worse on the ecosystem than other things that we do and one shouldn't feel shame. For many they have no choice: the factory farmed meat is what is available to them economically and geographically. These people who insist that they should "eat less meat" to save the environment are also the ones driving their cars and occasionally flying in airplanes and their environmental purity goes right out the window if these activities are taken into account. This statement is frankly yet another example of (usually white) privilege and often, naivety. The same people making this argument often subscribe things like the recent fire season in the West being a sure sign of Global Warming (it isn't - its a combination of North Pacific Decadal Oscillation and the El Nino/La Nina Cycles) when we have better indicators. It simply looks like our future to come. Another alarmist topic is the radiation in the Pacific Ocean from Fukushima is coming to poison us all. They know nothing about the radiation that has been coming down the Columbia River since the Manhattan Project from the Hanford Nuclear Reservation - or about basic concepts such as dilution! Don't even get me started about Lyme Disease which has been a big "disease du jour" for many or so they think. 5 years of unsuccessful treatment nearly killed me. Afterwards it was revealed that the main cause for my fatigue then was nothing more than easily treatable sleep apnea! Like the science deniers, those saying "eat less meat" to save the environment say that argument based on belief systems, rather than any good hard scientific analysis. Well said. Even as an organic grass fed producer I have said that as a society we should eat less meat, but I am speaking to an average I guess and really mean that we need to cut out the heat lamp meat... The American diet is out of whack and people truly do need to start voting with their wallets. I definitely agree that if people choose to eat meat they should buy meat from local farmers, from the grazers. But the problem still stands that if everyone ate the same amount of meat they ate today, we could not feasibly have enough land to support all of the free range animals. And along with that, the production of methane from the cows would still be catastrophic to the environment. There needs to be a combination of both reduction of consumption as well as eating meat from better sources. Very interesting article and thank you for the information here. I've attempted to wade through the comments to see if my question has already been answered, but honestly it's starting to give me a headache. You see, I'm not all that smart and there are a tremendous amount of big words here. So I figured I'd just put my question out there and hope that you or someone else can answer. A few things first: I recently switched to a vegan diet. I did not do it for moral reasons - I don't really have a hang-up with murdering animals. Whatever, it's cool, and the real vegans can get all mad about that if they want. I switched over because I believed, based on some things I read and what I considered common sense (but please recall that I'm not that smart) that is was overall better for the environment to "eat less meat." Then I figured, what's less than zero? So here is the actual question: if the type of grazing that you do is actually better for the World than a vegan diet, how do I go about purchasing it? How do I make sure the meat my family is eating was raised with these types of grazing practices? How do I "shake the hand" as you said in the article? In other words ... what would you recommend for someone in my position? I just want to eat in a way that helps the Earth, I'm okay with that being an all-meat diet or a no-meat diet, or anywhere in between. I don't have quick answer. Even a lot of grassfed producers aren't necessarily improving their landscapes. To begin with, where are you located? In the suburbs of St. Louis, Missouri. Even as a vegetarian, I generally concur - especially if the meat is raised on land that isn't or cannot be used for growing crops. But if you think of meet as only satisfying a need for protein then I don't think it is the best way to provide it to the world. There needs to be a database/ app that consumers can use to locate farmers who practice restorative grazing. If it exists, I wish this article would have linked to it. For now, I will continue to eat very little meat and try to find the time to research which farms to buy from. Consumers WANT to help but often aren't sure where to turn. Even Farmer's Markets might not have farms practicing sustainable grazing- thus vegetarianism for environmentalists grows. So, for those you’ve studied and believe your fails, you should still be saying eat less (of the other) 98+% of the meat. Eat less meat doesn't stop any animals from grazing. If we see a value, we can support the grazers for the work they do grazing. There's no need, benefit, or moral justification to make them give their lives in return for letting them walk around eating grass to do us a favor. And here's an economic argument: Industrially-produced meat is the only way to provide for the current appetite for animal flesh. Eat less meat has a long way to go before it cuts into your livelihood. You should be advocating for higher prices that will have the meat consumer paying enough to demand free grazing animals and put the most cruel industrial slaughter operations out of business. I’m interested to see what the author thinks in terms of accessibility to this “shake the rancher’s hand” meat. This is fine for people that have access to these farmers/ranchers but consider the millions of people in the nation that live in food deserts. These people don’t have access to “good meat” and even if they did, they could never afford it. It’s easy to say, “hey just cut a couple things out of your monthly budget to get good meat” but many people don’t have that option when they’re living paycheck to paycheck and have children to feed. This “eat good meat” mantra is fine for people with disposable income who have the luxury of living in a place where they can shake their farmer’s hand but by saying this, you’re also effectively cutting millions of people out of the discussion. 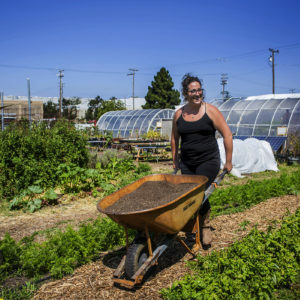 In short, I do agree with the author and by no means want to argue against the idea that we should be encouraging people to eat locally but I think it’s important to use this topic to also open up the discussion of how we help people living in cities or food deserts get access to this better meat. I really like your comment . Looking forward to the replies and hopefully info as to where to buy local products close to the Antelope Valley, Ca. I think you raise a great point, and I've got a lot of thoughts, but I think I want to sit with your question for a while longer. Very well written piece, although I didn't see the magic word, "moderation". If we consumed animal products as the rest of the world does, we would see vast improvements in our health, our ecosystem, and the environment. The amount of meat that we expect in a hamburger, say, can supplement a family of four on dinner tables in most other countries. We tend to polarize to extremities here in the US to the point of a similarly undesirable outcome. The old ranch I own in an area called the Chilcotin was used as a ranch because it was an area of natural grassland. Although that land was used by wildlife before the ranchers showed up the grass kept coming without cows. Now that I have kept the cows off my place the grass keeps coming and I think it is thicker and taller than before. Also the cows did a lot of damage to the land and I suspect the small lakes. Without the cows there are more mice and birds looking for them. Industrial meat production is very damaging whereas more caring meat production is obviously better but I still think that humans need to eat less meat for many reasons, methane being one important one. I try to eat less meat for my own health. This is a very good information. And I will try to buy grass fed meat when ever possible. I live in Southern California, any suggestion as where to purchase this type of products ??? Thanks in advance. While your grazing practices sound remarkable, and no doubt environmentally beneficial, your arguments objecting to the "eat less meat" movement aren't persuasive. Given the volume of meat consumption in the developed world, it is utterly unrealistic to think that that demand can ever be satisfied by enlightened practices like yours. Satisfying the demand for Big Macs now requires clear-cutting the Amazon rainforest, and imprisoning cattle in feedlots; or at least McDonalds thinks so, and does. That demand will never be met by sustainable farming like yours. Bovine methane production is a major contributor to global warming, and only fewer cattle will reduce that. So yes, better grazing practices are certainly beneficial for whatever meat it produces, but only producing less of it overall can save the planet. Your stewardship of the land is laudable, but advocating more meat consumption, rather than less, is misguided. Meeting the current meat demand could not be further from my point or my objective. When we eat what our bioregion provides, or what we can be assured is raised in a way that is truly beneficial, the supply question will answer itself. You'll note that in my piece I advocate only eating this kind of meat, and not beyond. This is truly the crux of what I wrote. Hmm. Interesting. However.... there is a very valid basis In the “eat less meat” ideology. Good writing and sharing of your experience! As an old age and owner running cattle for 20 years, I couldn't agree more.. We run a few head of cattle on our ranch because the Land Needs Them! I am a vegan and have been 4 a very long time I am 72 years old and am in amazing shape so much more than all my meat eating friends . I really can't understand y any one would eat meat or soy or dairy. Research this and become healthy and believe that u will easily live 2 b 100 years young. I am 77 and healthy and have been a vegetarian for 35 years, then a vegan the last 15. I never get sick. We don't need meat; we need organic plants. Don't eat less meat; eat no meat or dairy, both linked to cancer and other diseases. You're right in rejecting "eat less meat". The only solution to environmental devastation is to eat NO meat (or any animal product. You think you are grazing sustainably, but you are taking food and land away from wildlife. Further, there is not enough land to supply the volume of meat that humans consume. Meat is a major issue in the destruction of our planet, the same way tobacco is a major issue in lung cancer. However you tweak them, they are unhealthy and should be quit entirely. It is a pity even a well made argument is met by this misguided idea that meat is the culprit . For one thing the corn industry is measured into the amount of damage one steak costs the environment. Grasses and well grazed cattle are beneficial for the environment and good for the human body at the same time. Domestic livestock may well be robbing wildlife of forage in some areas, but the kind of meat I advocate is that which is raised to increase the productivity and biodiversity of land. It's not zero-sum at all. A lot of this has to do with how grass plants and some forbs and shrubs grow, at least in much of the West and Mediterranean climates. What's not eaten or trampled by animals chokes out further growth. Generally speaking, wildlife populations aren't sufficient for keeping this stuff cycled; consequently, the plants die back, the wildlife lose feed, and land degrades. I graze cattle because of my love for wildlife, and as such, I tailor my grazing to support more growth, not less. Perhaps worrying about cattle belching is a red herring. There are so many much worse global warmers than ruminants - like all the food waste rotting in landfills, for one - and grazed cows produce a net negative global warming effect by helping actually sequester carbon in the soil, giving back to the REAL saviors, who are the soil micro-organisms! Can you recommend your favorite purveyors of meat? I want to eat meat from healthy steers. What brands can I trust? It doesn't matter whether it is "good" for the planet or "bad" for the planet; what does matter is the immoral butchering of other sentient beings for humans to eat because that's what humans have always done. If it's not okay to butcher and eat a dog, then it's also not okay to butcher and eat a pig. As long as any bloodshed for human taste or vanity is socially acceptable, ours will never be a moral world. I respect your views and feel more accountable to the health of my surrounding ecosystem than any specific individual animal. We differ here, and there's no getting around that, but I appreciate that you are honoring your conscience. 2. Less than 3% is "pasture fed"
6. The proportion using expensive "restorative" grazing to prouce meat only the elites can afford is less than 1%. 7. There is no need for meat: people live longer and do less harm to the environment on a plant-based diet. Very provocative article, well reasoned. I'm left wondering how we stop the ADM- Bunge-Cargill train. The sheer scale of the practices that produce wealth and environmental harm seems destined to prevail. 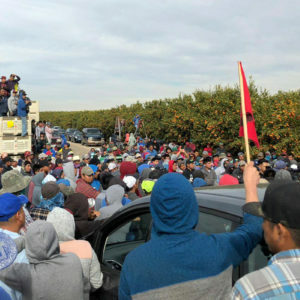 Not to be pessimistic, but I lived through and still participate in the back to the land movement in the 60s and 70s and, although I am proud of the changes we made and still try to make, I have never seen an opening to affect the tremendous scale that impacts the use of land and animals in such a detrimental way. Thank you, those of you who are raising food animals in the fields where they should be raised - where they contribute to keeping land healthy. I do like small quantities of meat every day, and want it to first, come from animals who have been treated very humanely, and second animals who are contributing to healthy soils. Treated humanely, until you kill them and eat them. This article is extremely myopic in failing to recognize at least TWO major issues that humans have decided to ignore---climate change and human overpopulation---climate change is rapidly exacerbating the damage to lands we have already damaged by our "development"---concrete, cities, obliteration of the world's carbon sink---forests, ocean acidification, mining, fossil fuel extraction, garbage dumps, massive overgrazing of marginal lands by herbivores and pastoralist peoples, extreme disruption of the water cycle, road building, industrial agriculture and associated industrial confined animal feeding operations that generate massive amounts of toxic waste. NONE of these things are admitted as part of the system this "program" fails to address honestly in a Planet intricately connected in all its life support systems. Finally, the Earth's human inhabitants number over 7.5 BILLION. This number, which is increasing exponentially, can not be sustained by "grassfed" anything on this planet. Humans have already tipped Earth into a tailspin. I welcome anyone to address the "grassfed" issue with admission of these facts. Yes, Susan, but having animals as part of the ecosystem where appropriate can actually sequester carbon. I've walked with scientists measuring this - feedlots heat the planet, contented goats in a forest contribute their bit to cooling it! It's a bad scene, and your articulation of it is exactly why I graze. I'm surrounded by over rested or over grazed grassland; these are already degrading and will only do so rapidly with a destabilized climate. We must improve our landscapes, now. Note that I don't advocate for grassfed wholesale, but rather for meat that improves its environs to sustain the health of the very life support systems you describe. Well writ, ma'am. Thank you for this thoughtful article and for all that you do toward a healthy, sustainable food supply. A beautifully written article. I myself have been vegetarian for 35 years and have no intention of changing my diet. But my husband, a committed omnivore, has begun eating (almost) only pasture-raised beef from a local, ethical, and land-loving rancher (or "grazier" -- this is a new word for me) and whole-butcher. I can respect that. I'm sorry but this article is utterly flawed from the foundations. Contrived animal populations managed by humans not only have nothing to do with ecosystem balance, they are among the largest destroyers of any such balance. The the gross inefficiency of calorie production through livestock is a crime against the planet and against the hungry. This self serving rationalist propaganda is outrageous. Actually, I understand your concerns with vegetarians, as my family were cattle ranchers for many decades. However, I must point out that humans don't need meats at all. I'm 67 years old, have no physical ailments, blood pressure,or joint issues. I attribute this to a decision I made when I was only 20 years of age. I stopped eating meat. The suffering brought upon our fellow creatures was the basis for my decision. People who claim they love the animals, but eat them, are obviously hypocrites. Would you eat your family, even if they died of natural causes? I don't think so. So how do I find a grazier near me? Since I live in Iowa, This probably sounds silly when I say I don't know how to find the right grazier. I just moved here and have no idea how to start "interviewing" farmers. Anyone know of a farm in eastern Iowa who is doing this? Hi Karen, if you shoot me an email maybe I can help. One reason to eat totally local is that we are just finding out that we are what we eat, and the foods that our foods ate, too! We used to want to eat low on the food chain - well, that chicken or cow fed on corn and beans is full of the glyphosate and other toxins, the lectins and omega-6 (inflammatory) fatty acids, etc. that they gave the chicken. Time to either have our own little guys scratching for bugs to give us eggs, or find a friend who does! All this neglects that these animals are treated like a crop rather than a feeling, thinking, social animal. Hopefully those who care for the environment care equally for the living creatures we share it with. Thank you for a cogent argument in favor of eating better meat - and allowing the prey animals we have farmed for thousands of years - a rightful place on a planet. It has been my lifelong feeling and conclusion that if we truly care about our planet we should take steps to slow/reverse the growth of our OWN numbers via birth control - and allow room for other species. What a joke. Nobody needs to eat animals, in order to be healthy or for any other reason. It is destroying the environment and gives humans cancer. Get off the meat, dairy, and eggs. It has been shown that Americans eat too much protein that adds to the overweight problems of this country. The answer is to eat somewhat less meat, but make sure it is high quality such as that raised by farmers that practice Regenerative Agriculture. The raising of animals is well described in this article. The other part of Regenerative Agriculture is to grow food for animals and people on this same land by rotating what it is used for and at the same time sequestering carbon in the soil to limit climate change. I agree with what is said in this article. I am glad to see that there are ranchers and farmers who are able to take care of the ecosystem and produce quality products from the land. thanks so much, Ariel, for your beautifully written and passionately argued piece. i've been distressed at how many of my friends are embracing veganism as a response to factory farms, not realizing that many of their vegetarian staples are also factory farmed, using extremely harmful and short-sighted farming strategies which are destroying (strip-mining) soils. we're modeling our tiny retirement farm on the subsistence techniques we saw in subsaharan africa during our 5 1/2 years working in agricultural development there. yes, we saw denuded ranges from massive over-grazing due to population pressures, but we also saw some of the most intensively productive and diverse plots we've ever seen by village farmers who have taken good small-farming practices and adapted them to fit their needs and culture. animal husbandry is an integral part of this. it has been rewarding looking for ways to incorporate some of this on our plot. in 3 years, our very marginal paddocks have blossomed into lush pasture for our handful of sheep. What I don’t understand is how you can find morality in taking the lives of other animals. We’re now in 2018. The industry of meat and dairy is clearly built on the distasteful path of pollution, suffering and lies. To justify that it is in any way beneficial for the environment clearly points to the fact that you are out of date and uninformed. Since you so cleverly try to claim that you know how the land works and can sense and feel it in your bones then you can clearly pardon the life of the animal that you kill as it will most willingly understand that it’s life that must end much sooner than it’s natural cycle was only important enough to be exploited raped then murdered. Observe and adapt to the changing times. We are evolved human beings that no longer need your industry. The sins you describe come mostly from conventional cattle industry which is dependent on a terrible farm bill, an appetite for cheap meat, and commodity grains. I don't participate in that industry. The land I work in seems to benefit significantly from animal impact and herbivory, since it co-evolved with such for millennia. I hope one day that can come from wild animals and not domesticated ones; in the meantime, I'm doing what seems best for the sake of the whole landscape to sustain and improve its health. We need to work on a lot of things at a watershed scale and beyond (not too big, not too small) to address what it takes to support and grow populations of wild herbivores. A lot of folks talk about the rights of nature, but then put up 8' fences around their properties, and drive so fast that deer and coyote get massacred on the roads. It's a big problem we'll all have to work on together to get real change. But, as to the rest, I don't think it's wrong to kill animals, so we're at an impasse there. Thank you so much for this article! Beautifully written. Thank you for healing the land, on ALL of our behalf. Interesting to read. What isyour location? I liked the care you extend to your land with the assistance of your herds. At the age of six to age 12, I visited the slaughterhouse owned by my father's best friend. I used to watch cows, one by one, step onto a platform and get shot in the head, then butchered, then hung up from the ceiling. It left an impression. For forty years, I have had no problem eating plants to sustain myself. I'm perfectly healthy and energetic. Everyone has to make a decision of eating meat from their own heart, and I don't judge. But I have to think, as I consider your argument, what would happen if humans did not exist on this earth and cattle were not raised to feed a human population. I seriously doubt the earth would suffer. The livestock industry has a terrible legacy. Raising animals within the confines of their environment, in a way that restores health, is a different paradigm entirely. I don't think the planet needs cows or any other domestic animal long term, but they can be a pretty great force for good in the interim. Finally you said it yourself in your own article ! Yes we are all going to have to eat less meat . As a person who has made the switch to vegan now I realize that because of world population we will need to be a lot of vegans and a small a number of meat eaters ( or none ) who eat maybe a couple to a few ounces of flesh food a week . Then we will be able to range happily a reasonable number of cows or other animals to have a good life . No matter free range or terrible factory farmed cows they ALL go through the same inhumane transporation and huge slaughter houses . Slaughter houses and the transporting of animals with no food or water in freezing or boiling temps must stop now too ! We need to stop looking at animals as a commodity . These are sentient individual beings that deserve our respect and great compassion , especially if they are going to end up nurishing our bodies . Well done! Your article gives a perspective that resonates for me as a fellow grazer. Thanks for your thoughts. Lands here did just fine for centuries. As Euro-Americans settled the country, moving westward from the east coast, they brought changes to native habitat through plowing and farming. Introduced cattle diseases and grazing competition with feral horses also impacted bison prior to direct impact by Euro-Americans. Historically bison were the dominant grazer on the Northern Great Plains landscape. This dominance shaped the landscape by affecting the pattern and structure of the grasses and vegetation that grew. Expansive areas of native grasslands allowed animals to flourish along with many species of other prairie wildlife. If grassland conservation is the goal, perhaps it's better to be open to using whatever strategies (or animals) can help achieve that. In very large prairies, bison may be the best fit – given costs, etc. Beyond this, there are the impacts of allowing grazing on federal lands at taxpayer expense and appropriate management of conflicts with predators necessary to the ecosystem too. The kill mentality management method needs to be updated to a collaboration management methodology that requires exhaustion of non-lethal deterrents before lethal force among other considerations. Personally, I don't eat beef or bison, or any land animal for that matter. Then, there is the matter of human overpopulation - the land can also only stand so much and we will need to find alternative solutions to our diets. But, the majority of people in this country who eat at McDonald's or other fast food restaurants aren't going to be able to afford to consume this meat. Would you still be so enthusiastic about preserving the ecosystem if you couldn’t utilize the animals for profit? Julie, profit isn't a profanity. Who pays your bills? I'm sure this person makes less than you. Animal agriculture is not a solution to anything, in any form. Once this planet was swarming with wild animals, but 90% of them have been killed (100s of species to complete extinction), and replaced with tens of billions of farm animals consisting of only few species. Animal agriculture is destroying the environment and causing the sixth mass extinction of species which is going on right now. It takes 10-15 times more land to produce meat than plants. So to help the ecosystem we need to stop animal agriculture alltogether, which means less land needed for food production -> more more space for wild animals and ecosystems to thrive. Wild ruminants used to graze our landscape, and the existing species that survive on their own, can be regenerated - and then leave them the f*** alone. I feel like this unnecessarily pits vegetarians/vegans/almost vegetarians against responsible grazing. I'm thrilled to see people out there trying to use the land more responsibly such as thoughtful grazing, leaning toward perennials vs annuals where possible, no till, and any number of a list of farming and grazing practices. And if there's a way to help I'll gladly do it. But I'm not going to do it by eating meat. After reading a number of your replies in the comments I realize that's not what you're suggesting. Nevertheless, that was the impression I got from the article, and perhaps why it has gotten at least some portion of the backlash in the comments (let's face it, it's the internet, there will be some backlash in the comments). I guess my concern is that's going to lead some portion, potentially a large one, of your target audience to tune out altogether. Quite a few of my friends and many of the YouTube creators I regularly watch have stated they agree with the overall vegetarian/vegan position, but nevertheless don't feel they can give up meat. That's the target market right there. People who want to make a difference, but still want to eat meat. I'm no expert in this area, so I won't claim to know how to connect those particular dots. But I feel like there is a potential market to be had, it's just a question of threading the needle to reach out to them. I'm not sure writing a counterpoint to "eat less meat" was necessarily the way to go. But then I read the article and I learned a good deal from it that I hope to pass on to those folks I know who still do eat meat. So perhaps it is a successful approach. Look how lovingly she poses with one of her cows here. You'd almost believe that she cared for them like her dogs and cats, that she didn't actually send them off to slaughter in their adolescence to profit on their young and tender flesh. If you're a meat eater with a conscience you may just believe in the fox minding the hen house telling you that buying her flesh products is the right form of "environmental activism." But you have to first believe in the underlying fallacy that raising artificially bred, domestic animals means restoring an ecosystem that relies on indigenous plants and animals to be left to their own devices which are instead decimated to make way for cows which are really nothing more than invasive species in this scenario. Yes, yes, yes!!! This is what we do with invasive plant removal in urban green space in NE GA. While I admire your work, what you've written here just doesn't add up. It is simply a question of available land. There isn't enough. Sure, rich people can eat like you suggest, but there isn't enough land to sustain the American diet for everyone. Could you really take on McDonald's as a customer? It is vital that we take meat consumption down to one serving per person per day at a kind of absolute maximum, hence "eat less meat." The problem is that you function as a kind of priest: if I buy a steak from you, I'm absolving my sins of eating industrial meat, because I'm showing that I care. Further, reading this, I see this picture of the rancher/hero/environmentalist that you are, so when I go to the supermarket I will find words like "grass-fed" and other meaningless stuff like this on the package, vaguely remember your advice and fall into the trap. Now sure, should I fly to Brooklyn to the retro/hipster butcher shop to buy your, or your equivalent's, meat? Sure. Can I practically do this? Can the vast majority of Americans practically do this? Now the actual solution to a lot of this is that the price of meat should probably be about what you sell it for (which when you say you don't make money I assume is reasonable). This would solve the problem, as only rich people could eat meat every day. But that's okay. That's the way people lived not so long ago-- the Sunday roast actually meant something. But since government policy isn't changing anytime soon, so in the meantime, my only option is to try to reduce the amount of meat I eat, since I can't afford the kind of proper meat you sell. So now we get to your real problem: that your target market doesn't want to see itself as rich. That, I don't know what to say to you about that. "Go ahead and eat a lot of meat, that's what you're supposed to do as rich people" doesn't sell as well as your citizen/rancher/environmentalist story I suppose. Your argument is rational and logical and well informed. Unfortunately the popular culture and media doesn't deal in such concepts. While I understand your point and commend your work, I have to wonder how you can push these ideas into the larger scale of our current global structure? It's easy enough for one person, or a dozen, or maybe even a few thousand in any given area to follow your logic through into practice but what about the billions of people who rarely have the opportunity to make the kinds of choices you're suggesting? I realize that what you're talking about would strengthen the entire global ecosystem, and as a meat-eater myself I applaud it, but how does your idea go from a niche theory to worldwide practice? Please understand, I'm not criticizing. In fact, just the opposite. Your article is wonderful but it feels like it's only written for a small audience, people who understand what a "grazier" is and what they do for the environment. While you describe your job beautifully it seems very distant from the daily life of the rest of us and, because of that, your ideas seem distant as well. I'm not sure what I'm expecting by writing this comment but I do hope it's possible to figure out a way to move these ideas into the mainstream social consciousness. There are probably many barriers I'm unaware of that will make this hard to do but one of the ones I can imagine is that the system you're describing everything sounds like nostalgia, maybe even a call back to the "cowboy days." If you or someone work with can "modernize" your ideas and present them in a form that looks towards the future instead of bringing up beautiful visions of the past, you may find a larger audience and the ability to make the bigger impact you desire. Thank you. I think it is fresh water depletion, accumilation of methane, and general low "need" for meat protein in the human diet that the term 'eat less meat' is meant to address. It is more about clean air, potable water, and general body health...not degredation of the grass lands, wet lands, forests, habitats, etc. It is easier to overdo it on the beef than other protein sources. Guess it should have just stayed eat more fruits and veggies all along to avoid confusion. They have protein--along with nuts, legumes, and fish. It is the consumption of meat in general. It's not all about the environment most of the time when that phrase comes up. I see it as 'drink less alcohol' or 'watch the sweets' not 'recycle' or 'save the whales'. PS--The great PNW always needs salmon farmers!! You would be helping to clean up the real issue these days for enviormentalists....that nasty mess that is now our world's oceans. The ancient human female only ate meat of animals that had been killed by another animal or died naturally. They would not kill an animal for its meat. The ancient human male, on the other hand, did kill animals for their meat because the innocent animals did not see man as a threat to themselves and were easiley approched and killed. Ariel, Terrific piece. I think those advocating meatlessness are receptive to discussion and learning. Only thing you could have emphasized more is capturing carbon and its tremendous potential but maybe making it so personal was more effective.